The deck’s theme is purportedly English traditional magic. Frankly, the deck focuses more on English history from Henry VIII to Charles II (1509 to 1685), a period that includes the regicide of Charles I and Cromwell’s Protectorate. There’s lots of build-up to the idea of magic…but then, not much of it appears. Some notable individuals from this period appear in the deck, like the aforementioned kings and Cromwell. Architect Christopher Wren appears, as does Sir Isaac Newton – a scientist, not a magician. There were plenty of individuals involved in the metaphysical and magical arts during this period, including Dr. John Dee and Edward Kelley, Alias Ashmole, astrologer William Lily, writers Chris Marlowe, Shakespeare and metaphysical poet Andrew Marvell, herbalist Nicolas Culpepper, et. al. Unfortunately, very few of these appear in the deck. There seemed to be very little relating to traditional English magic. No threshold spells, pargeting or half-timbering, cooking hearth magic, almanacs (best-selling books during those times), herbal magic, or anything relating to the Old Forest. No corn dollies, no John Barleycorn, no Mother Goose…but the Wicker Man is the main image in the Judgment card, and the Wheel of Fortune card has a gypsy. The text that accompanies the book features information for every card: keywords, a description of the card, an interpretation, and ideas to use in a reading. The “interpretation” section is contributed by writer Steve Dooley. Some of these commentaries provide unique insights, but some skew toward negative sentiments. For instance, when using the deck for a reading, the Knight of Cups appeared. It appeared to me as though he’d stopped to examine a fantastic cup because he was able to see something in it that others weren’t able to see. But when I turned to the book’s card description, it read, “Intense feelings that are difficult to own; a spoilt child; cruelty…he can’t ride and he’s about to take out his frustration on that poor horse.” That description just about knocked me off my horse! The final section about “Memory Theater” provides a summary of a popular mnemonic technique from this historic period. The artist, Rex van Ryn, is a notable graphic novel artist. The color palette is restricted to muted colors. The idiosyncratic imagery of the deck has only a nodding acquaintance with the RWS. The question is – does the differences have meaning, or it is different just to be different? 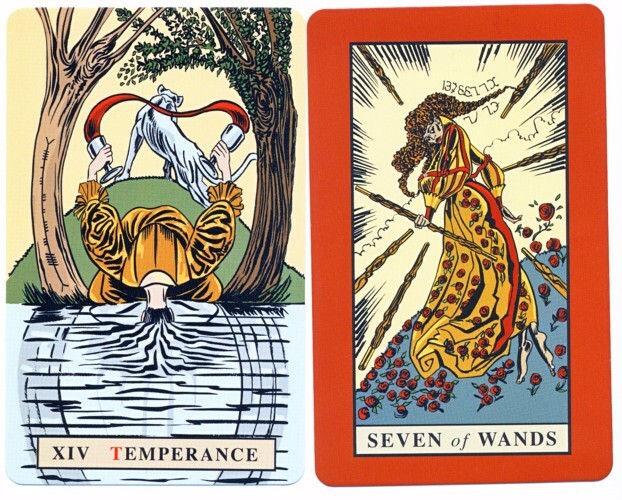 Temperance has her head in the water while juggling water between chalices behind her back. 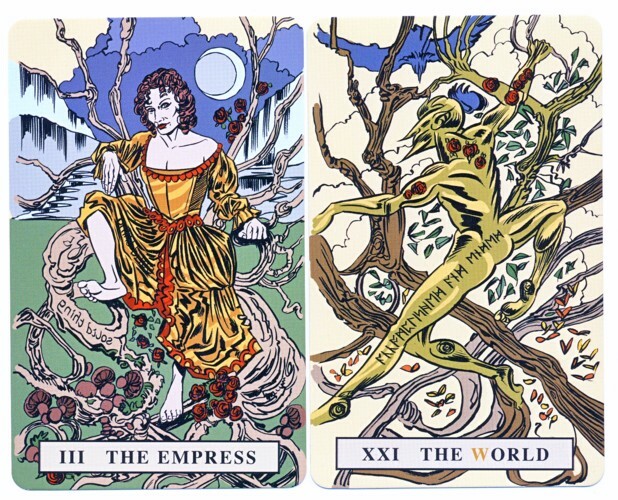 The Empress is seated in a rather bare tangle of branches – apparently waiting for summer to show up. The Universe is a wood sprite amongst tree limbs. The odd imagery continues into the pip cards. 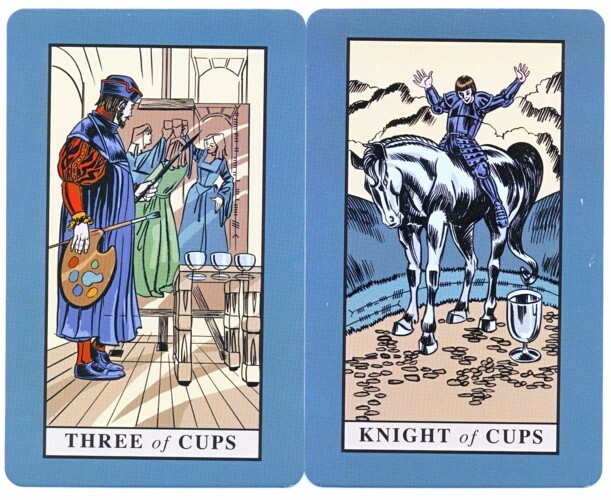 For example, in the 3 of Cups, the artist chose to include a number of optical illusions, like the cups that aren’t actually sitting on the table. In the 7 of Wands, a hunched-over woman is about to be slammed by several wands flying straight at her. She appears to be cringing instead of defending herself. The suits are color-coded by matching borders. The cards also include bits and pieces of magical writing in Ogham, Witch’s script, and Runes. Unfortunately, the meanings aren’t given in the book – the reader has to look them up. Tarotists who absolutely adore graphic novel-style art and more specifically, van Ryn’s work, will enjoy this tarot deck. People who are looking for juicy tidbits about traditional English magic, like suggestions for spells or magical craft projects, will be disappointed. Clearly the authors and artist had specific intentions when they produced the deck, but it takes time and patience to ferret out exactly what they were going for. Recommended for tarotists with some experience and the patience to experiment with the cards. 78 card deck, 149-page book in large book-sized box.